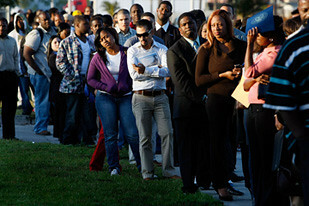 People wait by the thousands in the United States in a hopeless quest for meaningful employment. Despite claims by the Obama administration of a potential recovery, unemployment and home foreclosures continue to rise., a photo by Pan-African News Wire File Photos on Flickr. WASHINGTON — An emergency federal program that acts as a lifeline for 1.3 million jobless workers will end on Saturday, drastically curtailing government support for the long-term unemployed and setting the stage for a major political fight in the new year. The program, in place since the recession started in 2008, provides up to 47 weeks of supplemental unemployment insurance payments to jobless people looking for work. Its expiration is expected to have far-reaching ramifications for the economy, cutting job growth by about 300,000 positions next year and pushing hundreds of thousands of households below the poverty line. An extension of the unemployment program did not make it into the two-year budget deal that was passed just before Congress left on its winter recess. When the federal program expires, just one in four unemployed Americans will receive jobless benefits — the smallest proportion in half a century. At one point, Mr. Davis, 68, made more than $100,000 a year as an information technology expert and web designer. He is now living on ramen noodles and $140 he counted out from his change jar. Since being laid off over the summer, he has missed mortgage payments, forcing him to take out a reverse mortgage on his home. He sold his car and got a late-1990s model Ford Taurus, and is looking to cut his utility and cellphone bills. Soon, he might start taking Social Security. Democrats on Capitol Hill are pushing for an extension of the program, though the constrained fiscal environment makes its reinstatement somewhat less likely, aides said. Members of the Republican leadership have indicated that they might be willing to extend the benefits, but only if Democrats offset the new spending with other cuts. On Friday morning, President Obama called Senator Jack Reed, Democrat of Rhode Island, and Senator Dean Heller, Republican of Nevada, to extend his support for their proposal to extend emergency unemployment benefits for three months. “The president said his administration would, as it has for several weeks now, push Congress to act promptly and in bipartisan fashion to address this urgent economic priority,” said Josh Earnest, a White House spokesman. As the last payments are distributed, Democrats have initiated a campaign aimed at shaming Republicans — particularly those in leadership and in swing districts — for letting the program expire over the holiday season. Republican aides said they remained willing to negotiate. “Why didn’t they offer a plan that met the speaker’s requirements — fiscally responsible, with something to create jobs — or any plan, for that matter, before they left for the holidays?” asked Michael Steel, a spokesman for John A. Boehner of Ohio, the speaker of the House. Some Democrats have suggested that continuing the program for three months, with the estimated $6 billion in spending offsets coming from agricultural subsidies in the farm bill. But some conservatives have shown stauncher opposition. The loss of benefits is expected to drain billions in consumer spending from the economy next year. People losing their federal benefits — often benefits they expected to continue to receive for weeks or months into 2014 — described cutting back on Christmas, driving less, turning off the heat, draining retirement accounts, applying for food stamps, readying to move in with relatives and missing mortgage payments. The psychological toll is significant, too. Ms. Bogash said the loss of benefits has spurred her husband to collect his Social Security payment early, meaning smaller benefit checks in perpetuity. Extending the program for a year would cost an estimated $25 billion. But because recipients tend to immediately spend the money they receive in unemployment benefits, the effect on the economy will be amplified, economists said. The left-of-center Economic Policy Institute has said that the end of the program will cut job growth in 2014 by about 310,000 positions. Michael Feroli, the chief United States economist at JPMorgan Chase, has estimated that the loss of income will cut the country’s annual growth rate by about 0.4 percentage points in the first quarter of 2014. Ashley Parker contributed reporting from Honolulu.